The Bike Garden is located in Nuns Moor Park at the former bowling green area with an attached pavilion building. Following the space ceasing to be used as an active bowling green, and the pavilion building empty and subject to vandalism, residents and volunteers came together with the ambition to transform the whole space into a community space and garden to invite all the community to be part of. 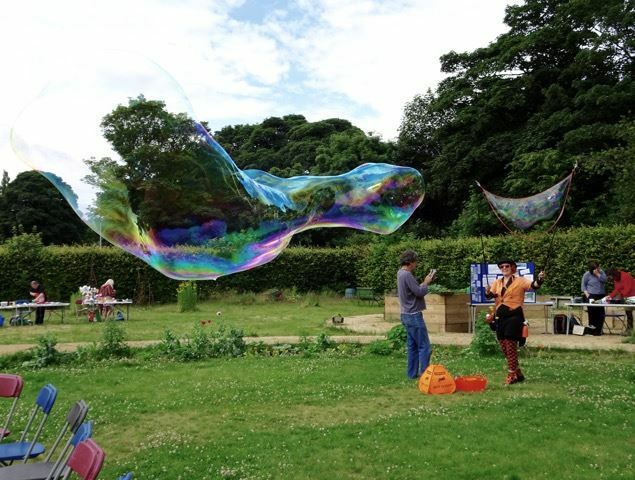 Through negotiating with Newcastle City Council in 2014, the Greening Wingrove Community Interest Company secured the opportunity to manage the site, to see whether there would be a future to consider. Sustrans also came on board to offer funding from Go Smarter, that would help to breathe life into the pavilion building and begin establishing the site as a cycling activity hub. The site have been transformed into a community hub and landmark, with bike related activities going strong and the venue being available for hire for community and private events. Plus, the Greening Wingrove CIC and Time Exchange have come together to develop the actual bowling green area into a community garden, with support being received through the W.E.A. Greening Wingrove Project’s Community Innovation Fund and Green Centre Fund. The Bike Garden is a welcoming space where people can come and connect to nature, food and community through activities and events.